Since LA has sunny weather 300 days a year, it’s as if the sky is almost always signaling us to get outside. 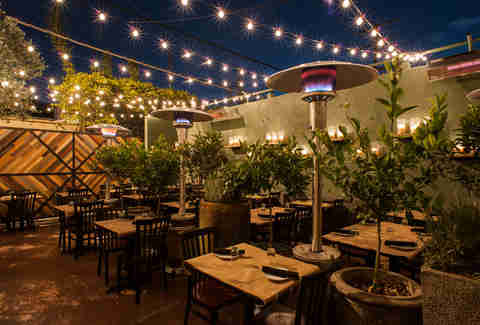 Thankfully, LA’s best restaurateurs understand that setting up outdoor patios is one of the best ways to take advantage of the sun -- which is why we’ve put together this list of 20 great places to sit and eat outdoors in Los Angeles. Chef Suzanne Goin and sommelier/partner Caroline Styne shifted their share-friendly Mediterranean restaurant from Mid-City to the shadow of Cedars-Sinai Medical Center in 2013. 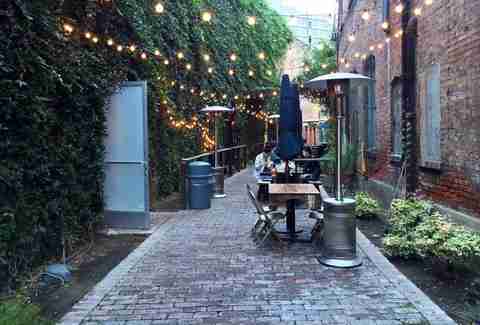 With one of the city’s great patios, A.O.C. makes it feel like you’re on the courtyard of somebody’s European villa. The partners even have an olive tree, which shades diners who partake in bacon-wrapped dates, Spanish fried chicken, and a flurry of vegetables. Weekend brunch is of course a natural in this setting, as are natural wines and Christiaan Rollich’s seasonal cocktails. 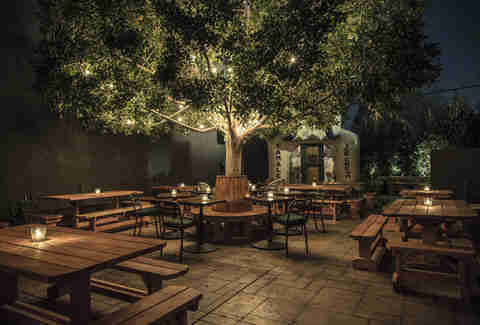 Walk through towering wood doors in Silver Lake to reveal another world, a tree-lined, romantically lit patio. The restaurant from designer Dana Hollister and her partners features eclectic décor, including a bizarre horse mermaid logo, but nobody minds, because they’re just happy to be there. For years, food was beside the point, until Vartan Abgaryan upgraded edible proceedings; he’s since ceded control to chef Gavin Humes, who carries on the emerging culinary tradition with dishes like diver scallop with carrot curry and puffed rice. This gastropub from Fork n' Awesome Hospitality Group (the pun-friendly team behind Santa Monica restaurants like Ox & Son and Art’s Table) might not look like much from the front. The surprise comes after you order at the front counter and retreat to the back patio. A mural of Humphrey Bogart from The Big Sleep sets the tone, complete with a quote from Raymond Chandler: "It seemed like a nice neighborhood to have bad habits in." 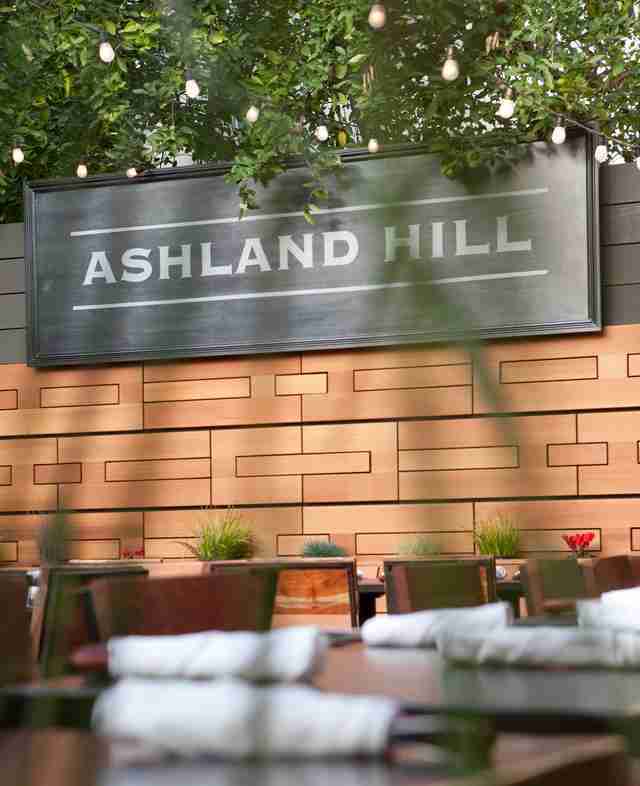 Two of Ashland Hill’s primary vices are the ambitious craft beer program and its burger, a behemoth from chef Bradley Miller with red onion bacon jam, sharp white cheddar, paprika aioli, and watercress, served with herb & Parmesan fries. Sarkis Vartanian is the Jackson Pollack of LA’s food world, taking a very free-form approach in a curved Arts District alley that came into fruition in 2011. A brick path with ivy-lined walls and mismatched tables has been a welcome home to the neighborhood’s creative types, who flock to the alley for Stumptown coffee drinks, egg dishes in the morning, and lunchtime sandwiches like “The Farmer,” which the menu humbly calls the “best sandwich ever,” and which comes loaded with roasted veggies and ancho chile jamon. Silverlake Wine co-founder Randy Clement, former Mozza chef Matt Molina, and other partners turned a once woebegone Arts District corner into a hotspot. 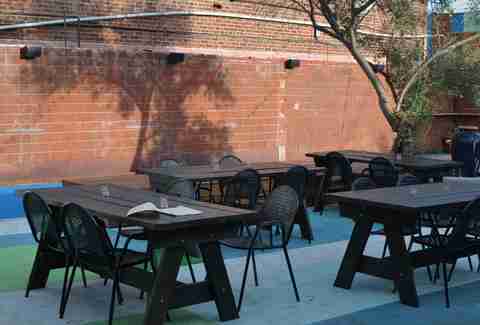 After entering the moody bar and seeing “My, That’s Better” in white neon, you may be tempted to stay indoors, but keep walking back: a big patio is open to the sky, and hosts dark-stained picnic tables, wood & brick walls, colorful patchwork flooring, and a blue bocce court. Grab a cool glass of rosé or a well-constructed cocktail and delve into Molina’s comfort-food menu, which includes a critically acclaimed burger, as well as taquitos and flaky biscuits. 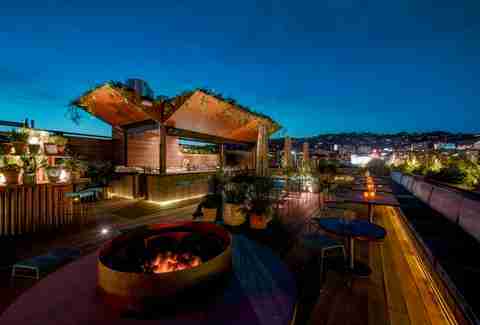 This buzzworthy rooftop bar is the Long Play portion of this music-themed complex from Australian owners DJ Grant Smillie, businessman David Combes, and model Ashley Hart. Low-slung seating offers 360-degree views of the city, including the nearby Hollywood Hills. Brittney Olsen now helms L.P.’s bar, which dispenses creative boba cocktails. Neighborhood fashionistas from design houses and modeling agencies descend on L.P., and the bar is an always-hopping weekend date destination. Forget the cocktails, craft beer, and better-than-average bar food -- the main reason to visit Idle Hour is definitely the setting. The 1933 Group revived this legendary North Hollywood bar, which dates to 1941 and last served as an apartment. The primary structure is barrel-shaped, which is a sight to behold, and the back patio is warm and welcoming, with picnic tables and shade trees. It even has a replica of Culver City’s bygone Bulldog Café, which is dog-shaped and accommodates just enough seats to host a private party. Chef Travis Lett is the pied piper of the Venice food world. Any concept that he and business partner Fran Camaj open, people flock to at the flick of an oven’s "on" switch. Gjusta is their latest triumph, behind Gold’s Gym, with display cases that would make a wealthy Venetian weep. Move left to right and encounter baklava croissants, fresh-baked breads, cured fish, pizza, rotisserie chicken, and Sightglass coffee. Continue to the back patio and find a bohemian wonderland with mismatched tables, strings of lights, and enlivening plantlife. 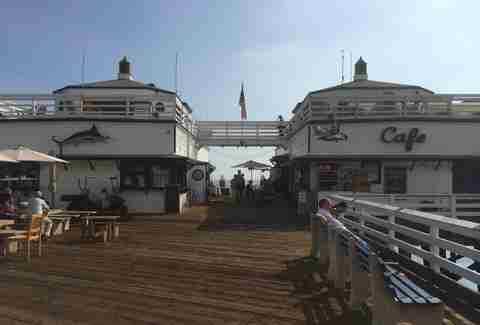 Chef Helene Henderson runs two restaurants on Malibu Pier, including this breakfast & lunch destination directly on top of the Pacific Ocean. Pass by casting fishermen to reach a rustic cafe with white walls and wood tables sporting lavender centerpieces. Yes, Malibu Farm has indoor tables, but the umbrella-shaded tables on the deck that provide views of surfers and paddleboarders from cushion-backed banquettes are far better. 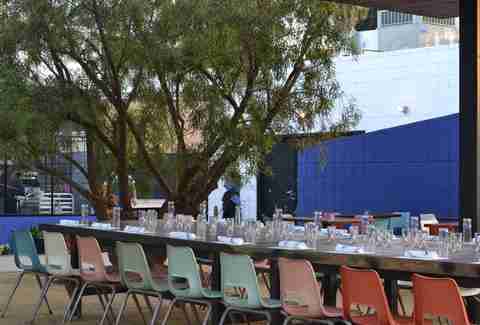 Wade McElroy and Russell Malixi have the only outdoor restaurant at Grand Central Market, and its communal seating provides views of passersby, Downtown office towers, and the incapacitated Angels Flight funicular railway that once climbed Bunker Hill. Communal wood tables provide a share-friendly forum to enjoy smoked meats like brisket, pork spare ribs, chicken, and craft beers (apparently it has salads, too, if you’re into that sort of thing). 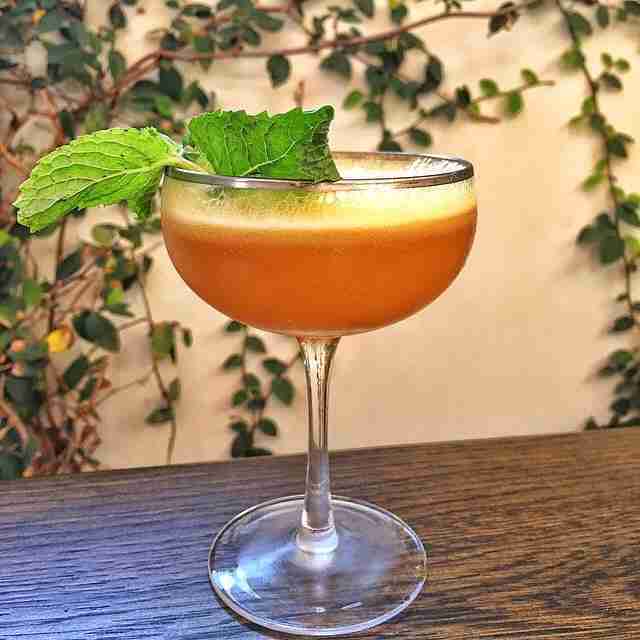 The Atwater outpost of Alex Sarkissian’s modern Mediterranean concept rests along railroad tracks, which means you’ll get the occasional horn blast in your ear. It’s worth it to experience the outdoor setting at the creative Atwater Crossing compound. A concrete patio with wood front gives way to coffee and wine bars, both fronted by stylish white & grey tiles. Marble communal seating adjoins a covered patio with blonde wood tables and white wicker chairs. Oh yeah, it also serves creative, sometimes atypical Mediterranean food, like avocado hummus and duck schwarma. Greenspan’s Grilled Cheese only tells part of the story on Melrose. Pass through the kitchen, up a small flight of stairs, open a door, and find Maré. This seafood-focused restaurant from chef Eric Greenspan and business partner Jim Hustead features mood-building plants and lights and a retractable roof to guard against unexpected “weather.” Most of the time, though, your view is of the night sky, and of brothy noodle bowls. Nobu Malibu 2.0 relocated from Cross Creek to the posh Malibu waterfront with help from landlord Larry Ellison. 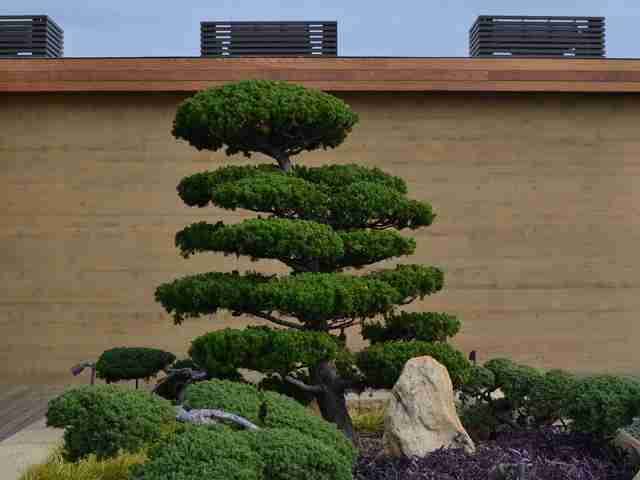 Now, you’ll find similarly modern (and pricey) Japanese food, but with far better views. The space features wall-to-wall wood and a lot of natural light. The patio provides views of Malibu Pier and pounding waves from cushioned lounge seating, with the breezy vibe accented by succulents and sculpted bonsai trees. Chef Eric Greenspan clearly has a thing for complicated entrances. You have to take two elevators at Mid-City’s Hotel Wilshire to reach The Roof. But, damn what a roof. 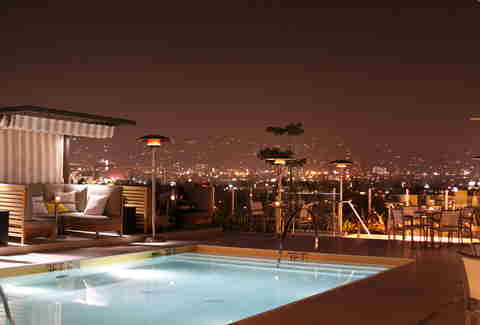 Cabanas ring a pool, and anywhere you sit, you’ll find panoramic city views, including nearby office towers, the Hollywood Hills, and so much more. Greenspan flexes his trademark creativity with dishes like pancake lasagna, but also knows when to show restraint, serving great seared branzino. 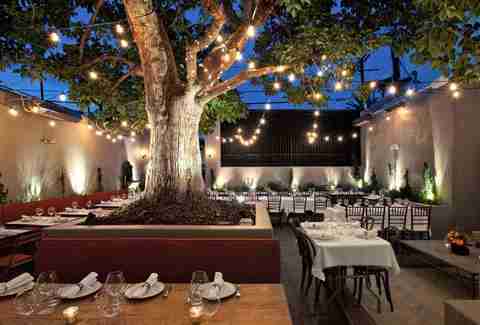 Patina Restaurant Group runs this restaurant and lounge on LACMA’s sprawling courtyard, in the glow of Chris Burden’s iconic "Urban Light" installation. The restaurant and bar are named for famed producer Ray Stark, who made movies like Steel Magnolias and Annie. The experience is far from dramatic at Ray’s and Stark Bar. 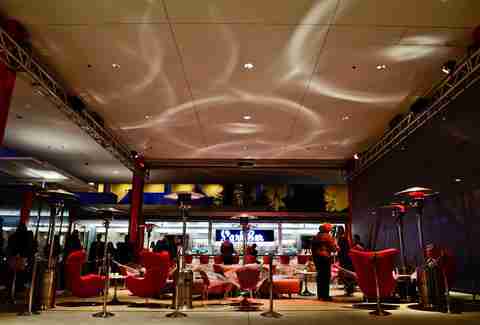 Tables line the plaza, running along a glass-framed dining room, and a bar features sumptuous red lounge chairs (and cocktails) that encourage guests to linger, especially on summer Fridays during the museum’s live jazz series. In 2015, native New Yorker Stephen Kalt revived a well-regarded New York City concept he commanded in the ‘90s -- Spartina -- naming both restaurants for a John Casey novel. 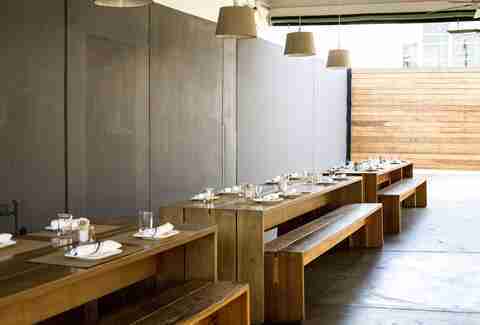 The chef practices transparency on Melrose, presiding over an open kitchen and featuring a big patio out front. White walls frame wood tables (filled with seasonal pizza, pasta, and salads) topped with strings of moody lights. 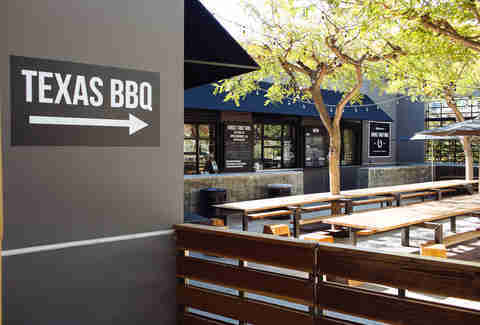 This just-opened restaurant from chef Esdras Ochoa and Billy Silverman resides at an LA River bike trailhead and occupies Antonio Salazar’s former auto body shop at the mouth of the emerging neighborhood of Frogtown. A tidy dirt patio houses shaded tables, and the former auto bay is the domain of bartender Aaron Melendrez, who incorporates aguas frescas. Ochoa, a Mexicali native, contributes creative, often wood-grilled Mexican cooking, including tacos, burritos, and more. 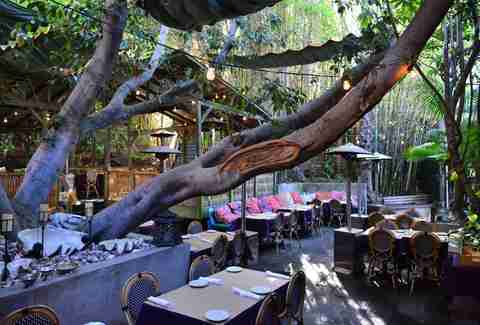 Terrine draws at least some of its powers from the Javanese bishopwood tree that serves as the central focus of the restaurant’s back patio, which is clearly the best place to be when the skies don’t cry. Even when LA does experience rain, this accomplished restaurant still has plenty to fall back on, including Kris Morningstar’s rustic French-Cal cooking and the suave hospitality of front of house partners Stephane Bombet and Francois Renaud, who both grew up in France and have firm grasps on wine. Resident bartender Ryan Wainwright and his team are also ready to serve, with dangerously deft cocktails. 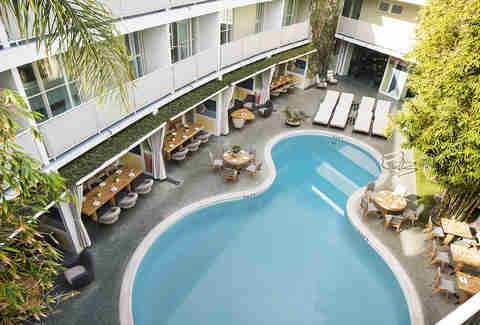 Bombet and Renaud also preside over Viviane, a modern French restaurant with chef Michael Hung that revolves around the courtyard pool area in Avalon Hotel Beverly Hills. Designer Kelly Wearstler contributed her fashionable flair, including colorful geometric patterns on the walls of cushioned, vine-framed cabanas and wood tables. Check the restaurant’s geotag on Instagram to see just how fashionable the clientele can get, including a fleet of fashion designers, models, and the occasional actor. Wolfgang Puck manages this culinary oasis in the ritzy Bel-Air hills, leaving seasonal California cuisine in the capable hands of chef Hugo Bolanos. Brunch and afternoon tea are both legendary at Hotel Bel-Air, for good reason. Splurge-worthy food and service are consistently good, and the setting is picturesque. The restaurant’s covered patio features floral accents, white-clothed tables, and warm wood panel flooring -- and you can even say hi to a resident swan on the way to your car. Joshua Lurie is the LA-based founder of Food GPS, a company that showcases the best-tasting food & drink through online coverage and by producing unique culinary events. Follow him on Instagram and Twitter.